Oleg teaches both Violin and Piano lessons for students of ages 4 and up. Adult students are encouraged to explore either instrument as well. When teaching either traditional Russian method, Fiddle Essentials, or Jazz Standards, Oleg customizes lesson plans for each student individually, and selects pieces based on students progress. 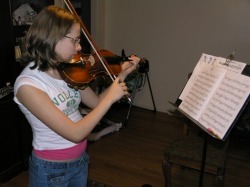 Music lessons provide a great opportunity for students to explore the new world of performing arts with a fun approach. Join Us Now! Students between ages 4-7 don't need very long lessons. Half hour lessons are usually enough for them, because their attention starts to fade away after 30 minutes of work. Older students can enjoy longer lessons: 45 minute to an hour. Keep in mind, the longer the lesson, the quicker the learning process will progress. The difference in learning progress is astonishing for students who take longer lessons.